This shea has a slightly firmer texture than unrefined shea butter, with hardly any aroma. Its clean, white appearance is incredibly useful in skincare, and wonderful incorporated into creams, balms, soaps & lotions. We are very proud to be able to offer this very special shea butter that has been fairly traded from a project in Ghana. This project was helps to support the communities and it has gained NOP Organic and EU certification. Please read more about this wonderful project and how the shea butter goes from little nuts to this beautiful, natural butter. This shea has been gently refined using methods approved by the Soil Association. It produces a 'cleaner' butter that has been filtered and is much lighter in colour, has a lower odour and a slightly firmer texture (although not as firm as our standard refined wild harvested shea butter). 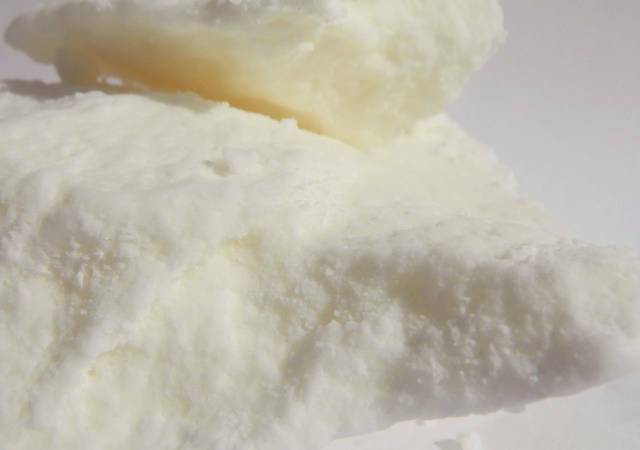 It is wonderful incorporated into creams, balms, soaps & lotions.Â There are lots of recipes that use shea butter in our resources and Members Recipes. Shea butter contains vitamins and other active elements such as cinnamic acid, which can help protect the skin from UV rays as well having healing properties. It also contains 5-10% phytosterols, which help to stimulate cellular regeneration and growth. It is highly moisturising and protective having mild anti-bacterial and anti-inflammatory properties. Soft fluffy and very very easy to work with! Wow! So smooth and no grainy at all. I will buy much more. I have never tried anything like this before. Creamy and fluffy, wonderful. Lovely product and a great price. Thank you.